Overall the M100 is a decent laptop that can perform under pressure, thanks to its dual-core processor. Its light weight and low heat output also make it very versatile. The fingerprint recognition software is a cool feature to have and definitely helps improve the laptop's overall security. 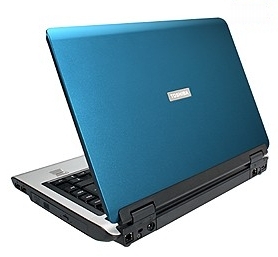 The inclusion of Toshiba proprietary software also makes it a worthwhile buy if you are a first time laptop user. So, if you are looking for a notebook strictly reserved for work and can live with the fact it isn't the best entertainment centre, then the M100 might be right for you. I'm extremely impressed with my Toshiba Satellite M100. It's a beautifully designed, powerful machine and it is very, very light. It is a really good choice for those who intend to use it as I do: for school and entertainment and medium to good quality gaming. It stands up solidly to competitors, and in my opinion, is much prettier than most equivalent computers. Its price is amazing compared to other machines of its size and quality, and with dedicated graphics, it is a force to be reckoned with. The few problems I have with it are very minor and only because I had such high expectations. Overall, I'm extremely pleased with my purchase and like my computer more every day.